Anyway, I’ve decided that’s not true, or rather, they’re not alone. I must add my mom, her cousins, my Grandma and her siblings, and myself, who feel the same about my great-grandparents house in Sycamore, IL. As Nassau Ave. is to my my daughters, South Ave. in Sycamore is to my family of origin. Those lucky enough to have grown up within the walls of those homes each love them as much as any other member of their families. Only a few from the South Ave. era remain to vouch, but agree they would. 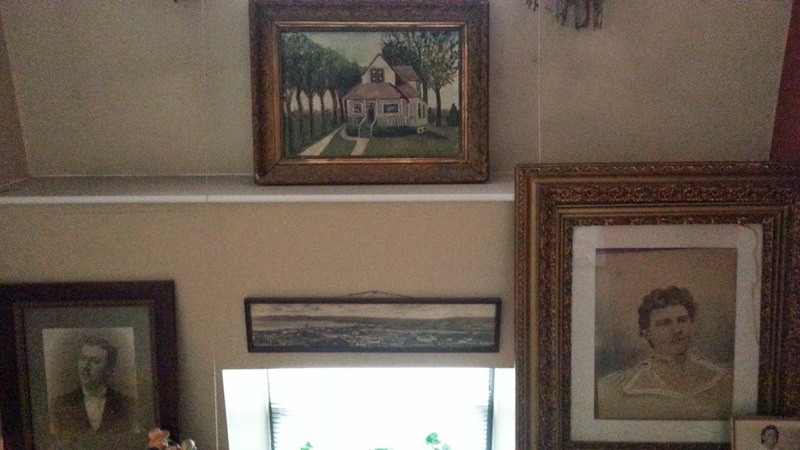 In fact, my mom had a picture painted by our neighbor, and it sits above my great-grandma Mama and her husband Papa, and the town he immigrated from in Jönköping, Sweden. They follow me in all of my homes. And in so doing, they’re a daily reminder that without question homes are where our hearts are, not where the buildings are built. We’ll have more addresses between then and now. They’ll all hold important memories because they’ll all have the benefit of our family and our love―captured slices forever only ours to reminisce. But that lesson comes with hindsight. What lingers to my daughters from their youth in Norwood Park and mine in Sycamore are the magical moments of childhood. I know that for sure for many reasons. But a big one is because no matter that we moved, when one of those beautiful young women come “home,” plops down on the comfy chair, and sighs, “it’s so nice to be home,” that moment and my heart overflow with more love and gratitude than one can imagine is containable even though we’re not on Nassau Ave. Yes, I know they’re expressing relief from a long day or week, and they may not think they mean it literally, but I know one day they will understand it wasn’t Nassau in Norwood Park. Just as my mother understood it wasn’t just South Ave. in Sycamore, but the lessons we learned there. Rarely a day goes by when I don’t realize just how smart my mother was. Her asking our neighbor, Nancy Cassato, to capture memories by painting that home on South Ave. becomes a brilliant reminder that our memories and all that is so meaningful truly reside in the heart, not solely in a building. The picture Mrs. Cassato painted keeps not just Sycamore alive for me. I look at it and always also think of our neighbor and her family and those memories that are no less as enchanting and hold even more recollections of wonderful times. Not from within the walls of 661 South Avenue, but ones that began from there, where that love was first nurtured. Home is where the heart is heard.